White finish slides for 94001, 94003, 94004, 94005 and 94008 curtain rods. Makes your drapery traverse with ease. Corner elbow adjusts from 90 to 180 degrees to allow coverage on corner and bay windows. Black and dark brown colors are in stock, ready to ship. Custom colors take five to seven days to finish. Charleston collection by Design Elements. Broad rings for 1 1/2 inch diameter indoor or outdoor curtain rod. Available in two colors in stock, ready to ship. It can be used indoor or outdoor. Use on those windows that face patio or pool area, or use inside on any window. Charleston collection by Design Elements. 2 inch inside diameter, 2 3/4 inch outside diameter. Paris holdback for 1 1/2 inch diameter indoor or outdoor curtain rod. Available in two colors in stock, ready to ship. It can be used indoor or outdoor. Use on those windows that face patio or pool area, or use inside on any window. Charleston collection by Design Elements. Kirsch wood trend wood rings for 3 inch wooden curtain rods, 4 per bag. Wood used for curtain poles is fine grain hardwood. For wood grain look, select a stain finish. Kirsch wood trend end cap. Kirsch wood trend wood brackets 4.5 inch returns for 3" wooden curtain rod. 7 3/8" front to back x 1 1/8" thick x 4 15/16" base height, 3" clearance behind pole. 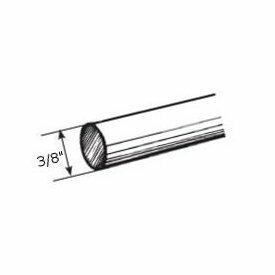 This 36" long swing arm curtain rod can be cut down in length. Available in two stock colors, and custom finishes. Stock colors can be used indoor or outdoor. Custom finishes are for indoor use only. Charleston collection by Design Elements. Use indoor and outdoor, black and dark brown only. Custom colors for indoor use only. Cut to your size. Give wall to tip of rod size. Note: Cut rods and custom finishes are not returnable. All indoor only colors are custom painted. White finished sixteen foot extruded aluminum curtain rod designed for commercial or residential use. Baton drawn or open and close this pre-drilled for ceiling mount rod by hand. Carriers available for pinch pleat or ripplefold systems. If cut for shipping is selected, choose Cut for shipping method in the check out. Must be less than 104". White finish anodized aluminum track. . Includes track , 9406 carriers and 9684 end stops. Bend is an additional charge. Can be bent approximately 8" and 12" radius or circular curved 36" radius minimum. Creating: Add 30 percent to rod before bending charge. Minimum and maximum crating charges. For quoting purposes, identical rods may be packed approximately 15 per case. Curved drapery rods for windows with curve. Base price includes first three feet. Plus truck freight over 104". Mini scroll sconce by Graber can be used to hold 1 3/8" wood poles, a towel holder, custom swag treatments on regular windows and even arched windows. Flat Endcap finial for the Charleston 1 1/2" diameter poles. Black and dark brown colors are in stock, ready to ship. Custom colors take five to seven days to finish. Charleston collection by Design Elements.